Follow I-81 south and take exit 90 (Rt. 72 south). Follow Rt. 72 south to the Lancaster area. Approximately one mile past the Rt. 30/Rt. 72 junction, turn right at the traffic light onto Dillerville Road. At next light, turn left onto Harrisburg Pike. Franklin & Marshall is 0.5 mile ahead on the right. From the Baltimore Beltway (I-695), exit onto I-83 north. Follow Rt. 83 north to York, Pa. Take exit 19A (462 east, Market Street). Cross over Rt. 462 as you proceed through two lights and come to a third at Rt. 30. Turn right onto Rt. 30 east to Lancaster (approximately 20 miles.) Take the exit for Harrisburg Pike. Turn right at the light at the top of the exit ramp and proceed toward Lancaster City. Franklin & Marshall is about 1.5 miles and several traffic lights ahead on your right. Follow Rt. 41 north from Hockessin, Del. to Rt. 30 junction in Gap, Pa. Turn left at the light at the Rts. 41/30 junction onto Rt. 30 west toward Lancaster. Follow Rt. 30 west for approximately 10 miles. You will pass the shopping outlets and continue to follow Rt. 30 west as it becomes a 2 lane highway. For a tour of downtown Lancaster: Look for Rt. 23 west (Walnut Street) exit. Continue west on Walnut Street for approximately 2.5 miles/12 traffic lights to the intersection of West Walnut Street and College Avenue. Turn right onto College Avenue and proceed approximately 0.25 mile. The main campus will be on your left. For a more direct approach: Continue to follow signs for Rt. 30 west (York). Pass Oregon, Lititz and Fruitville Pikes. Just beyond Fruitville Pike, bear right to continue on Rt. 30 west (York). Take the next exit, Harrisburg Pike (The Park City Mall will be on right). At the top of the exit ramp, turn left onto Harrisburg Pike. Proceed 1.5 miles through several traffic lights until you reach College Square (on your left). The main campus of Franklin & Marshall will be on your right. Take the New Jersey Turnpike to exit 6 (Pennsylvania Turnpike west). Take the Pennsylvania Turnpike west to exit 286 (Lancaster/Reading/Rt. 222 south). Take Rt. 222 south approximately 14 miles to the Lancaster area. For a tour of downtown Lancaster: Stay to the left and exit onto Rt. 30 east (Coatesville). Proceed less than one mile and exit onto Rt. 23 west (Walnut Street). Continue west on Walnut Street for approximately 2.5 miles/12 traffic lights to the intersection of West Walnut Street and College Avenue. Turn right onto College Avenue and proceed approximately 0.25 mile. The Admission Office is on the right; the Admission parking lot is on the left. For a more direct approach: Stay to the right and follow signs for Rt. 30 west (York). Pass Oregon, Lititz and Fruitville Pikes. Just beyond Fruitville Pike, exit to continue on Rt. 30 west (York). Take first exit for Harrisburg Pike (The Park City Mall will be on the right). At the top of the exit ramp, turn left onto Harrisburg Pike. Proceed 1.5 miles through several traffic lights until you reach College Square (on your left). The main campus of Franklin & Marshall will be on your right. Take the Pennsylvania Turnpike west to exit 286 (Lancaster/Reading/Rt. 222 south). Follow Rt. 222 south approximately 14 miles to the Lancaster area. For a tour of downtown Lancaster: Stay to the left and exit onto Rt. 30 east (Coatesville). Proceed less than one mile and exit onto Rt. 23 west (Walnut Street). Continue west on Walnut Street for approximately 2.5 miles/12 traffic lights to the intersection of West Walnut Street and College Avenue. Turn right onto College Avenue and proceed approximately 0.25 mile. The main campus will be on your left. For a more direct approach: Stay to the right and follow signs for Rt. 30 west (York). Pass Oregon, Lititz and Fruitville Pikes. Just beyond Fruitville Pike, exit to continue on Rt. 30 west (York). Take first exit for Harrisburg Pike (The Park City Mall will be on right). At the top of the exit ramp, turn left onto Harrisburg Pike. Proceed 1.5 miles through several traffic lights until you reach College Square (on your left). The main campus of Franklin & Marshall will be on your right. From north of Harrisburg, take Rt. 15 south to Rt. 322 east. Cross the Susquehanna River and continue to I-81 north/Rt. 322 east. From I-81 north/Rt. 322 east, take I-83 south to I-283 south. Exit onto Rt. 283 east (to Lancaster). Take Rt. 283 east to Rt. 30 west toward York. Take the first exit for Harrisburg Pike (The Park City Mall will be on right). At the top of the exit ramp, turn left onto Harrisburg Pike. Proceed 1.5 miles through several traffic lights until you reach College Square (on your left). The main campus of Franklin & Marshall will be on your right. Take the Pennsylvania Turnpike to exit 247 (Harrisburg East). Take the first exit on your right (immediately after the toll booths) to get onto Rt. 283 East. Take Rt. 283 east to Rt. 30 west towards York. Take the first exit for Harrisburg Pike (The Park City Mall will be on right). At the top of the exit ramp, turn left onto Harrisburg Pike. Proceed 1.5 miles through several traffic lights until you reach College Square (on your left). The main campus of Franklin & Marshall will be on your right. 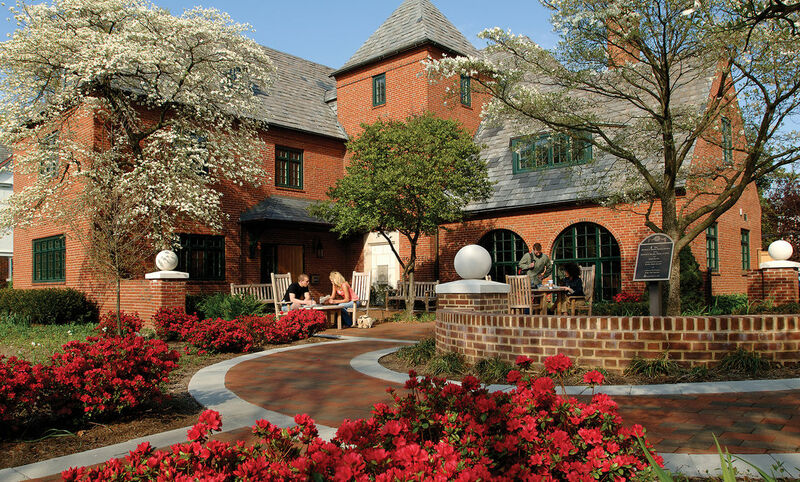 The Office of Admission is located at 637 College Avenue in the Wohlsen House. For assistance, please call 877-678-9111. Admission Parking Lot: Proceed from the Harrisburg Pike exit of Route 30 about 1.5 miles. Turn RIGHT onto College Avenue. The Office of Admission is located on the second block on the left. The address is 637 College Avenue. Parking is across the street behind the visitor stands for F&M's track and field stadium (Williamson-Sponaugle Field).. If you are traveling by train and can access Amtrak stations in New York City, New Jersey, Philadelphia, Pittsburgh, Washington, D.C., Baltimore, or any other points that connect to Lancaster, the Lancaster Train Station is less than 2 miles from F&M's campus. When taking taxi service to campus, direct the cab driver to the Office of Admission at Franklin & Marshall at 637 College Avenue. The cab fare will be under $10.